Florida State has a unique challenge to face in 2018: Replacing a national title-winning coach, still in his prime, with an up-and-comer. Still, Willie Taggart is just the man to turn things around in Tallahassee after the Seminoles’ disappointing 7-6 season saw Jimbo Fisher leave Florida State for Texas A&M. The former South Florida and Oregon coach was born and raised in Florida, knows the recruiting landscape from his time at USF and now has experience coaching at a big-time program after his lone season with the Ducks. All told, Florida State Football has a bright future under Taggart; but what will the Seminoles’ season look like in 2018? FSU ranks No. 20 in Sporting News’ updated way-too-early top 25, but faces three top-10 teams in 2018, not including its season-opener against No. 15 Virginia Tech. It’ll be challenging in Taggart’s first season. April 14 Garnet and Gold Spring Game Tallahassee, Fla.
Sept. 3 No. 15 Virginia Tech (Monday) Tallahassee, Fla.
Sept. 8 Samford Tallahassee, Fla.
Sept. 15 at Syracuse Syracuse, N.Y.
Sept. 22 Northern Illinois Tallahassee, Fla.
Sept. 29 at Louisville Louisville, Ky.
Oct. 6 at No. 7 Miami Miami Gardens, Fla.
Oct. 20 Wake Forest Tallahassee, Fla.
Oct. 27 No. 2 Clemson Tallahassee, Fla.
Nov. 3 N.C. State Raleigh, N.C.
Nov. 10 No. 9 Notre Dame Notre Dame, Ind. 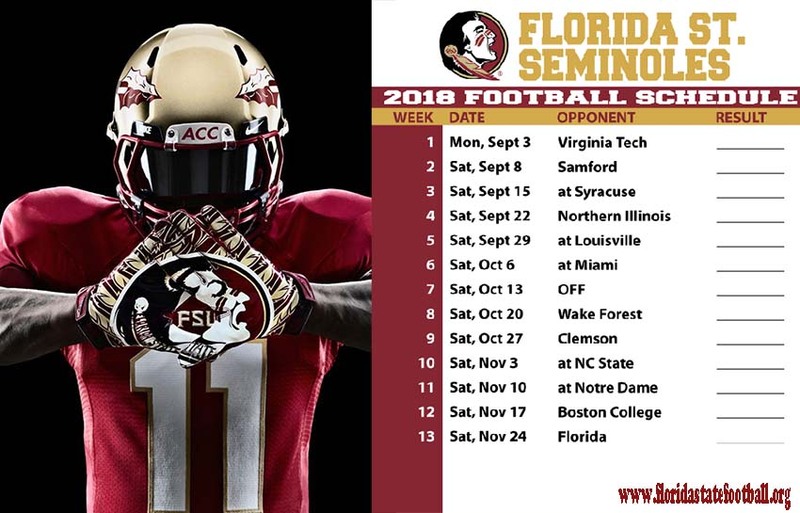 Nov. 17 Boston College Tallahassee, Fla.
Nov. 24 Florida Tallahassee, Fla.
Dec. 1 ACC championship Charlotte, N.C.
Florida State’s 2018 recruiting class ranks 11th nationally and third in the ACC, per 247Sports’ Composite team rankings. Taggart also managed to secure three early enrollees, including safety Jaiden Woodbey, FSU’s top-rated player in the class at No. 35 overall. The Seminoles got two more top-100 players in cornerbacks Anthony Lytton (No. 50) and Asante Samuel Jr. (No. 60). In all, 13 players in Taggart’s 21-man class were rated with four stars. The upcoming quarterback competition between Francois and Blackman will be the prevailing storyline in the spring, summer and fall, with the loser likely transferring out of Florida State. Blackman filled in admirably for an injured Francois in 2017, though he was prone to mistakes that typically vex freshmen playcallers. Still, his performance over the last four games of the season (53 of 84 passing for 637 yards and 10 touchdowns to three interceptions) will at least make him a strong candidate to keep his starting role. Francois, of course, is battle-tested from 2016, and has an athleticism that may better fit Taggart’s offense. Regardless of who takes over at quarterback for Florida State, Akers will be a key component of how the offense runs in 2018. The No. 3 overall player in the Class of 2017 got a great start to his college career in 2017, averaging 5.3 yards a carry for 1,025 yards and seven touchdowns. If the Seminoles can maintain some semblance of continuity along its offensive front next season, Akers stands to improve on those numbers and become a bigger part of the passing game. Look for him to have a breakout season. 3. Next up in front seven? The Seminoles lost five defensive players to the 2018 Draft, including likely first-round safety Derwin James. But the biggest area of need easily comes in the front seven, where the Seminoles have just five scholarship players at defensive end heading into the spring. Thankfully for FSU, Taggart picked up five players in the latest class to fill in the front seven. In the meantime, expect Brian Burns and Joshua Kaindoh (the No. 10 overall player in the Class of 2017) to pick up some of the slack.